Biola University is growing fast—in fact, it was recently recognized as a “Top 10 Up and Coming” national university by U.S. News & World Report. Founded in 1908, the Southern California institution serves more than 6,000 students and offers over 150 online, in-person, and in-distance programs at the baccalaureate, graduate, and doctoral levels. With such large growth, it’s not surprising that the university decided to further develop its campus with a new building—the Lim Center for Science, Technology, and Health—to accommodate its curriculum and expanding student body. To ensure the installation stayed in budget and on time, Spinitar built an “optimal and functional plan,” according to Valentino. The budget was pre-built to avoid any surprise costs, and Spinitar attended weekly project status meetings with Biola to ensure there was consistent and transparent communication. Working closely together allowed Biola to save approximately $150k in additional fees on this $650k project, according to the integrator. In the planning process, Spinitar developed standards for classroom AV in the Lim Center, which were only allowed to be modified for specific use cases. The university’s Dean specifically requested to reduce the number of lecterns so only a few classrooms have lecterns and the remaining rooms have a small AV cart—which is semi-hidden. All classrooms use Epson HD projectors and Creston Digital Media and control systems, including Crestron amplifiers and speakers. With standardized touch panels and control equipment across the campus, instructors have the confidence and expertise to utilize all of the technologies with ease, says Spinitar. Biola’s Nursing Labs contain the most technologically advanced system on campus where cameras, microphones, speakers, and IVIS software assist with instructor/student engagement by providing two-way communication. The integration firm also incorporated a centralized management system into the Lim Center AV system to allow for remote help desk support and analysis for all AV systems on campus. 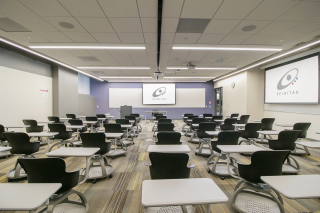 “This type of forward-thinking also serves as a launchpad for updating future classrooms, while providing Biola’s IT team better information and support capabilities across all standardized classrooms with the integration of Crestron Fusion,” said Carl Adams, account manager, Spinitar. In nursing simulation rooms, AV and communication hardware and software allow professors and instructors to observe, record, and manage audio and video during simulated training experiences. Cameras, microphones, speakers, and IVIS software assist with instructor/student engagement by providing two-way communication.